Fiat and Chrysler deal confirmed | What Car? The strategic alliance between Fiat and Chrysler has been completed. The US Supreme Court gave the deal its seal of approval on Wednesday. Fiat's chief executive, Sergio Marchionne, will head the new company, which will become operational immediately. The deal will not cost Fiat any money, but the manufacturer will use its technology to help Chrysler build smaller, more environmentally friendly cars. 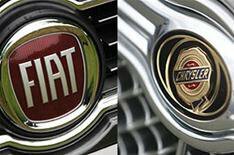 Fiat's alliance should now pave the way for Chrysler to emerge from bankruptcy protection.